Dexedrine is a stimulant drug that is available in tablet or sustained-release capsule form and generally prescribed to treat narcolepsy or attention deficit hyperactivity disorder, also known as ADHD. Dexedrine is a central nervous system stimulant. Exactly how it works is not known. It affects certain chemicals in the brain which may help to improve attention span and behavior. 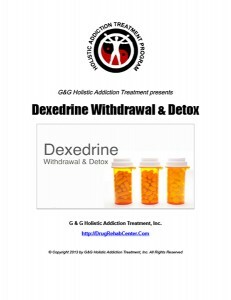 When Dexedrine is used chronically and in sufficient quantities a person will become dependent on Dexedrine and will experience withdrawal symptoms upon cessation of use. What are the withdrawal symptoms of Dexedrine? The withdrawal symptoms of Dexedrine include: depression, cravings, exhaustion, confusion, psychotic reactions, intense hunger, drowsiness, irritability, increased sleeping, disturbed sleep and violence. When Dexedrine use is stopped abruptly, these withdrawal symptoms can be severe. Medically supervised gradual withdrawal is when a strict schedule is put into place to reduce Dexedrine dosage at a safe and steady pace. This reduces withdrawal symptoms and ensures the safety and health of recovering users.